We all have pet peeves. There are people or things that “push our buttons.” When our buttons are pushed we tend to become more stressed and agitated. More self-awareness of our triggers, and how they affect us, is important to reducing the corresponding stress. Let’s start by looking at some example triggers. I’ve divided them by how they show up: in our bodies, our worlds, and our minds. Triggers can be felt sensations in your body. Maybe your palms get sweaty when you are nervous about saying something in a meeting. Maybe you get a pit in your stomach when you are presented with something that feels overly risky. It could be that you feel short of breath in certain situations. And some of you may feel your emotions in your body, which can sometimes be a trigger. 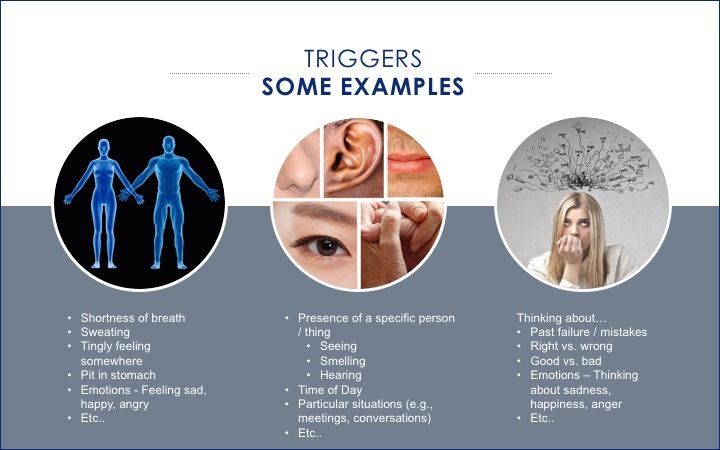 Triggers can be in your world, experienced directly via one or more of your five senses. One of the most common triggers is a specific person. You can be triggered by seeing them, hearing their voice, or even just reading their name. Some triggers are more situational. For example, maybe you’re triggered when you hear someone complaining. Triggers can also be in your mind. You might be triggered by things you perceive as right or wrong, or good or bad. You might believe that an idea won’t work because you’ve tried to do something similar in the past and it didn’t work. When you have these thoughts, you may be triggered to dig in your heels and be less open-minded. Let’s look at one of my known triggers to see how it may impact my behavior. This provides grist for the internal mill. It’s a great time to ask myself challenging questions, such as “is it healthy for me to be taking on stress due to other people’s driving habits? Do I want my mood to be affected in this way and even impact my interactions with other people?” If the answer to one or both of those questions is “no,” I can use my awareness of this trigger to identify counter-measures. •	Taking a deep breath and relaxing each time I’m triggered by another driver. •	Yelling inside my car to let out ..and let go of…the anger energy. •	Checking myself when I arrive at my destination to ensure that I’ve let go of any associated stress or anger and that I’m not carrying that with me as I leave my car. Now let’s work in the opposite direction. When working on altering Self-Limiting Behaviors, it’s helpful to pay attention to identify any triggers that may be associated with the behavior you are trying to shift. Think about your own life. Choose one thing that you know triggers you and spend some time self-observing and reflecting on how that impacts you and those around you. Start to experiment with tactics (e.g., take some deep breaths) that will help to diminish or eliminate any negative side-effects you experience from this trigger. Remember, small shifts lead to big changes.